BJ “The Prodigy” Penn and Hilo, Hawaii, United States and Ryan “The Wizard” Hall of Falls Church, Virginia, USA were two of the mixed martial artists who competed at “UFC 232.” It was the final event of the Ultimate Fighting Championship for 2018. Featuring 13 MMA bouts, “UFC 232” took place at The Forum, Inglewood, California, USA on December 29, 2018. Penn faced Hall in the fifth bout of the evening. Hall was born in Arlington, Virginia on February 22, 1985. He is training out of Tristar Gym in Montreal, Quebec, Canada. In 2015, Hall made his UFC debut by competing in four bouts in “The Ultimate Fighter” Season 22. Including these four bouts, “UFC 232” marked his sixth UFC bout. Penn was born in Kailua, Hawaii on December 13, 1978. He is training out of Jackson Wink MMA in Albuquerque, New Mexico, USA. The Hawaiian fighter has been competing in the UFC since 2001. “UFC 232” marked his 24th bout in the promotion. 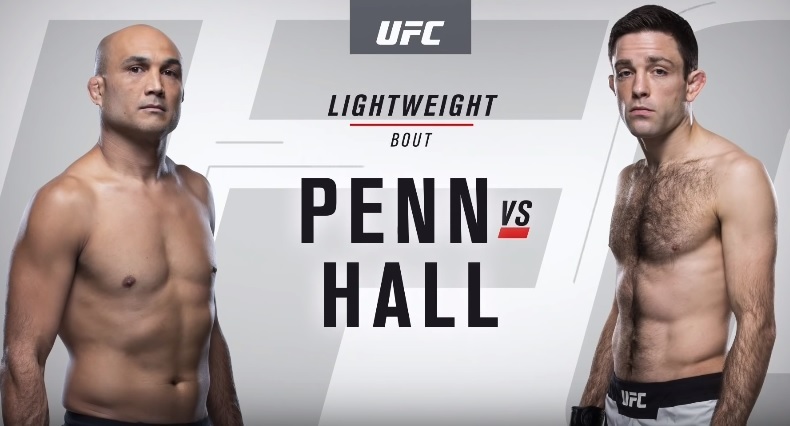 Penn and Hall competed in the lightweight division. Referee Edward Collantes put a stop to the contest at 2:46 of the first round when the fighter from Virginia submitted his opponent from Hawaii via heel hook. Winning at “UFC 232” improved Hall’s professional MMA record to 7 wins and 1 loss. He is now riding a seven-bout winning streak. On the other hand, Penn now has 16 wins, 13 losses and 2 draws. He is now riding a six-bout losing streak.